A few months ago I signed up for a program called Vocalpoint after reading about it on moneysavingmom. The basic idea is that you take a few surveys online and then you receive products and coupons pertaining to the survey a few weeks or days later. It sounded good, but then I never took the time to do any surveys, until just recently. I feel like I hit the jackpot! I took one survey and a few days later I received this pamphlet in the mail about Kashi’s new waffle. 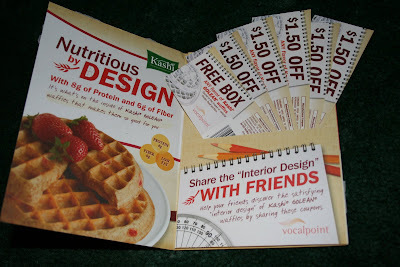 In the pamphlet was a coupon for a free box of Kashi’ frozen waffles and five $1.50/1 coupons! 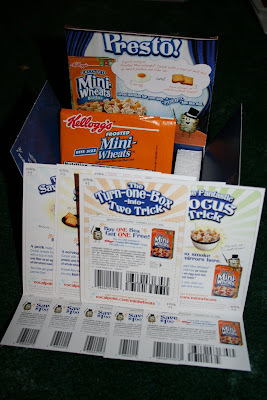 Then I took another survey, which usually only take about 2 minutes, and a few days later I received a box containing a sample pack of Kelloggs Shredded Mini Wheats, a BOGO coupon and six $1/1 on any Kellogg’s cereal! If you want a way to get some extra coupons for free, or just like receiving free stuff in the mail, then go here to join Vocalpoint now. It is definitely worth your time! Angela I love Vocalpoint! Beyond the coupons and samples you get I was even invited to a focus group for Vocalpoint and made $100 for a 2 hour focus group. I'm still a newbie at it as well, but it does seem that the surveys sent by email are the ones that generate the gifts. I'm still messing around with it though. I'll keep everyone posted when I receive new things. Oh, I totally did not internalize the whole taking the survey thing. I'll look at it again now, THANKS! I agree. I cannot figure out how to get the surveys that send you product. Do you have to wait to get an email asking you to take a survey? So, you wait for the email with the survey in it? I just signed up and I see where it says Surveys at the top of the page but those are only 3 questions long. Doesn’t seem like what you all are talking about. I have belonged for about 6 months. The coupons they send are always VERY generous! was it the surveys or the “activities”that you took part in on vocalpoint? i’ve never really understood how to “play” but i’ll take another look!